Lasarte is the two-star Catalunya outpost of the renowned Basque chef Martin Berasategui at the Condes Hotel in Barcelona. 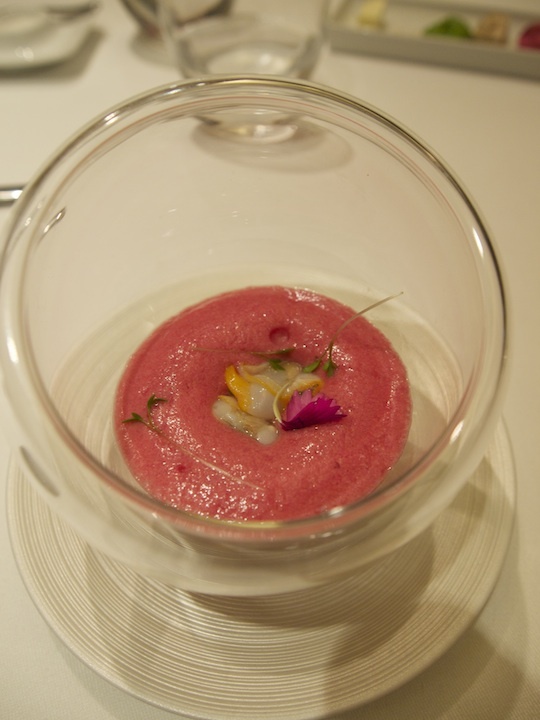 The restaurant is named after the Basque town near San Sebastian where Berasategui's three-star restaurant is located. 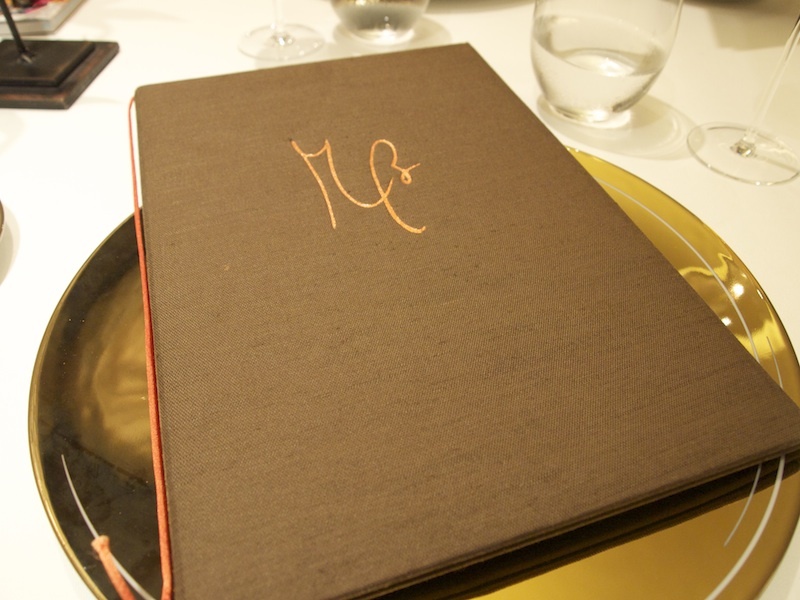 Lasarte opened its doors in January 2006 and that same year the restaurant was awarded its first Michelin star. A second star followed in 2009. Head chef at Lasarte is Paolo Casagrande, who has been working with Berasategui for years. Lasarte is open for lunch and dinner Tuesday till Saturday and the restaurant offers a 10-course tasting menu for €125, a 5-course Lasarte menu with classic Berasategui dishes for €75 (lunch only) and there's the a la carte menu. I had lunch with my husband at Lasarte on Friday 26 October 2012 and we both had the Lasarte menu. First some nice but relatively simple appetizers arrived: (i) Iberico ham croquette, a delicious crisp croquette with a creamy and soft ham filling - (ii) Parmesan cream with cured bacon, lovely intense Parmesan flavours and tasty, finely diced bacon - (iii) Green olive with grapefruit, lovely subtle bitters and the olive was nice and juicy - (iv) Melon Caipirinha, lovely lime flavours, not too alcoholic - (iv) Curried pistachios, nice light and warm curry flavours. 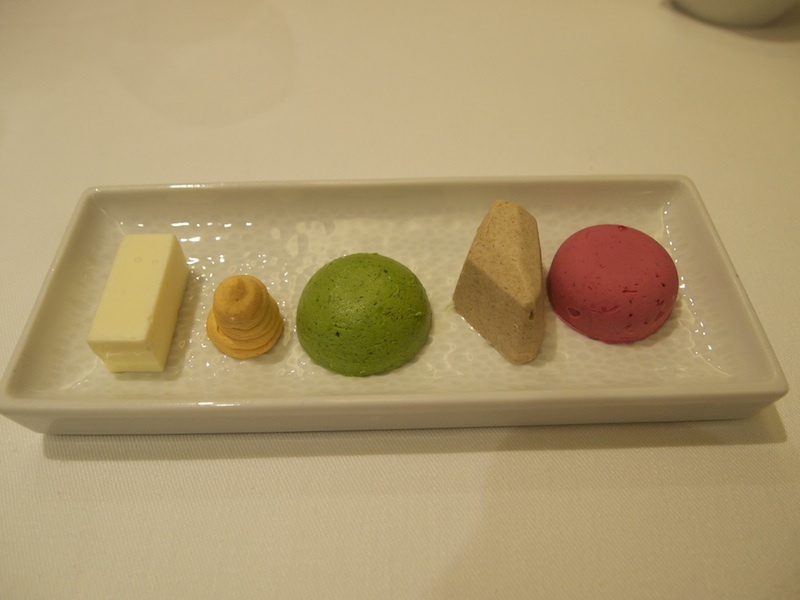 A collection of salted and flavoured butters was served with the bread. The butters were flavoured with tomato, spinach, ceps and beetroot. My favourites were the tomato and the cep butter. Both the spinach and beetroot were very colourful but didn't have much flavour. 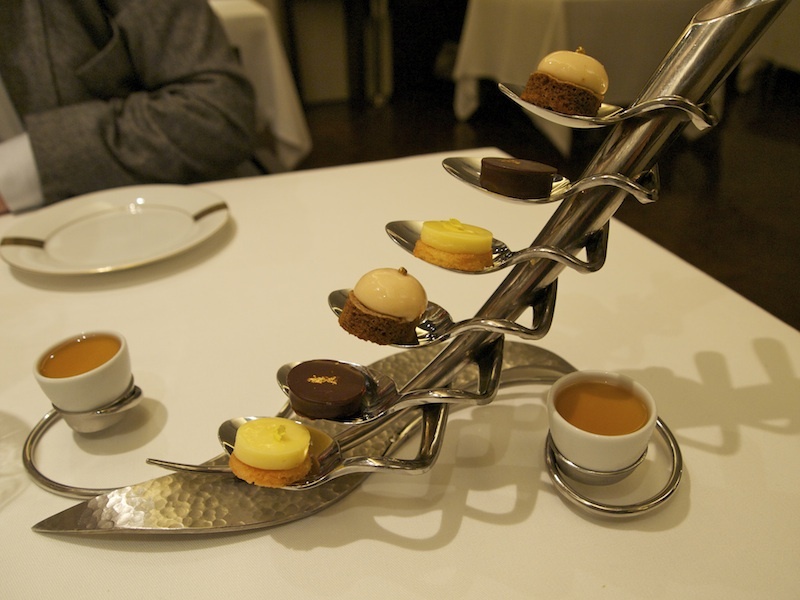 Next we were served two amuses bouches. First a 'mille-feuille' of smoked eel, apple and foie gras. 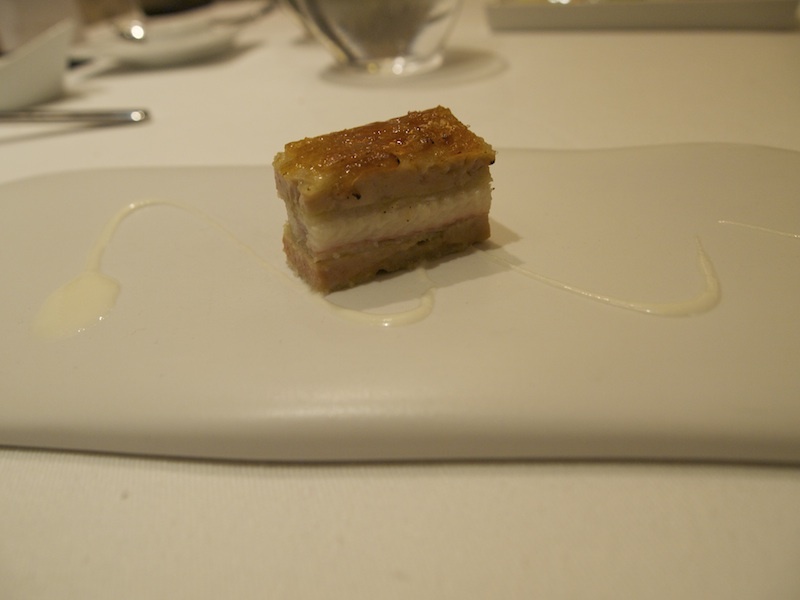 A beautifully made, elegant eel sandwich with lovely, caramelised mille-feuille pastry. The smoked eel was nice and meaty. This was followed by a Tomato and peach gazpacho. A lovely, sweet and delicate, gazpacho foam with light cucumber flavours, served with some fresh cockles. 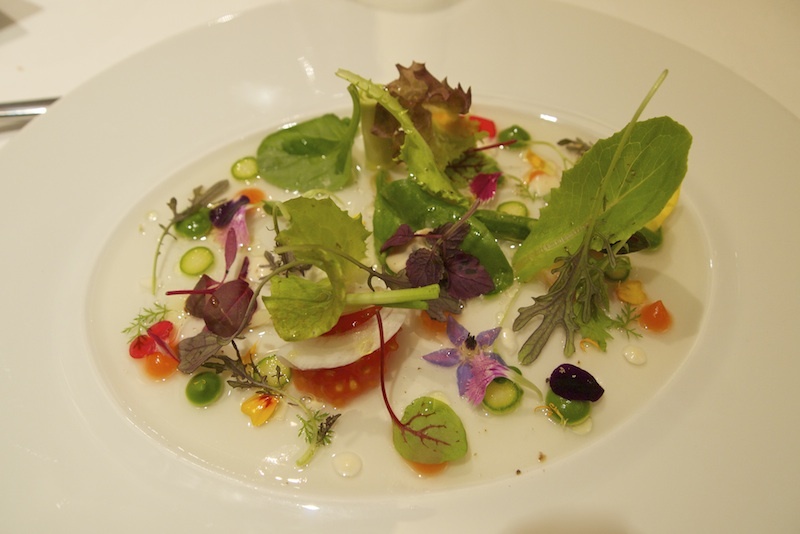 The first course of the Lasarte menu was "Salad of vegetables, herbs, shoots, petals with 'iodised' jus and lobster." Perfectly clear tomato jelly with lovely clean tomato flavours and a touch of acidity. On the tomato jelly was this beautiful and delicious arrangement of herbs, leaves, flowers, thinly sliced baby courgette, avocado, dots of lettuce cream and a (sadly) tiny piece of lobster. A lovely dish with surprisingly intense flavours and a dish that captures finesse and elegance perfectly. 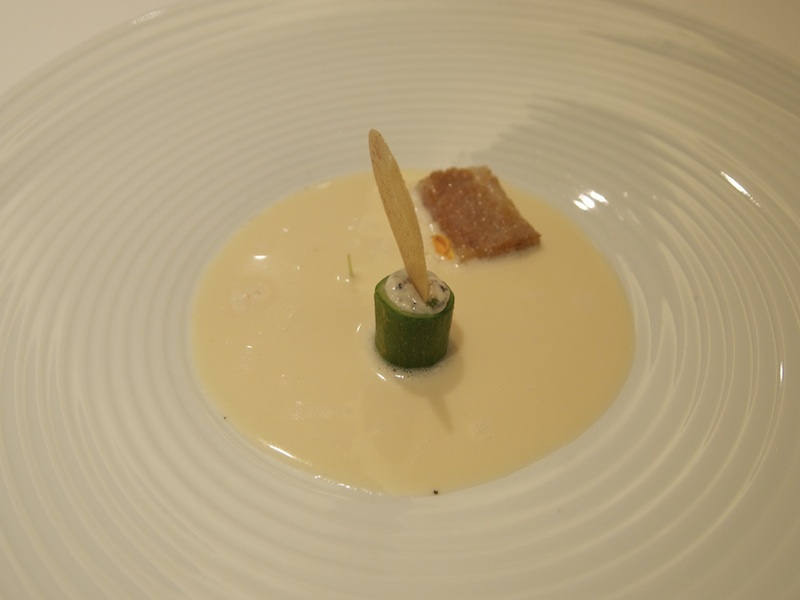 Second course: Cured Iberico ham soup, bacon, stuffed courgette and a Parmesan cracker. 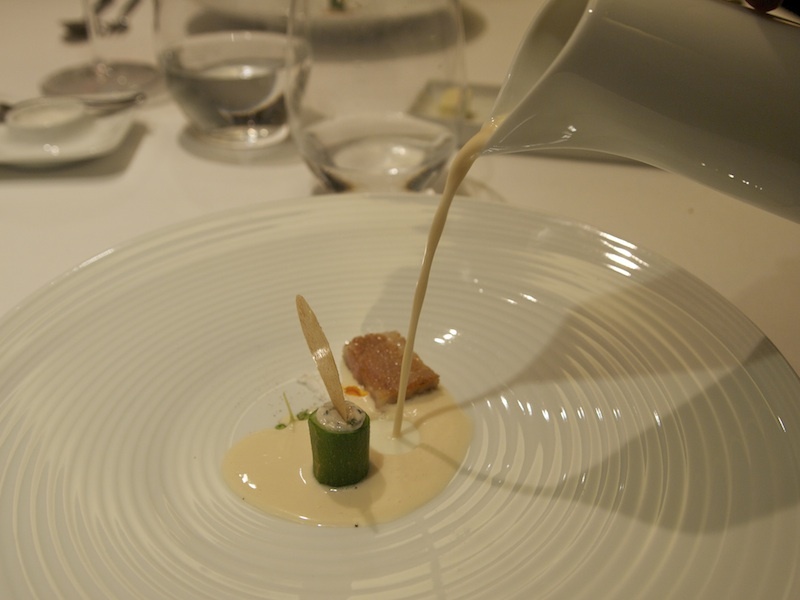 A lovely pure and creamy Iberico ham soup which had a wonderful, long aftertaste. The courgette had a nice, creamy and sharp, soft blue cheese filling and the bacon was tender and flavoursome. I'm not sure whether it actually was bacon. The English menu does mention bacon (pork belly), the Spanish menu however refers to "papada crujiente" (crispy jowl). Either way, a hearty soup, nicely presented but at the end of the day it remains just a creamy ham soup. On to the third course. Charcoal grilled tuna belly (Ventresca), mango, capers, soy sauce, celery minestrone, parsnip cream. Absolutely stunning pieces of tuna belly. Soft, creamy, fatty and with wonderful, light charcoal flavours. 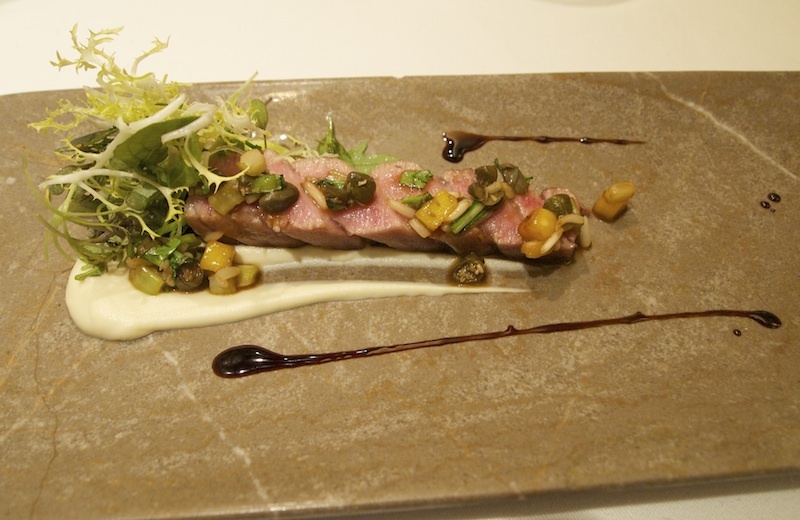 The tuna belly combined beautifully with the sweet mango and salty capers. Lovely freshness from the celery and the bean sprouts. Also on the plate was a fantastic concentrated pigeon jus which was dark and rich and had a hint of soy. An utterly delicious dish; the tuna was sensational. Next the fourth course: Fillet of beef, potato and bacon 'mille-feuille', foie gras sauce. The beef had a fantastic caramelised crust and looked perfect, but looks can be deceiving. It tasted rather bland and was underseasoned. The potato, bacon, and Comté cheese mille-feuille on the other hand was delicious, as was the buttery and velvety potato mash. Unfortunately, the dish was crying out for more foie gras sauce. A hit-and-miss affair. 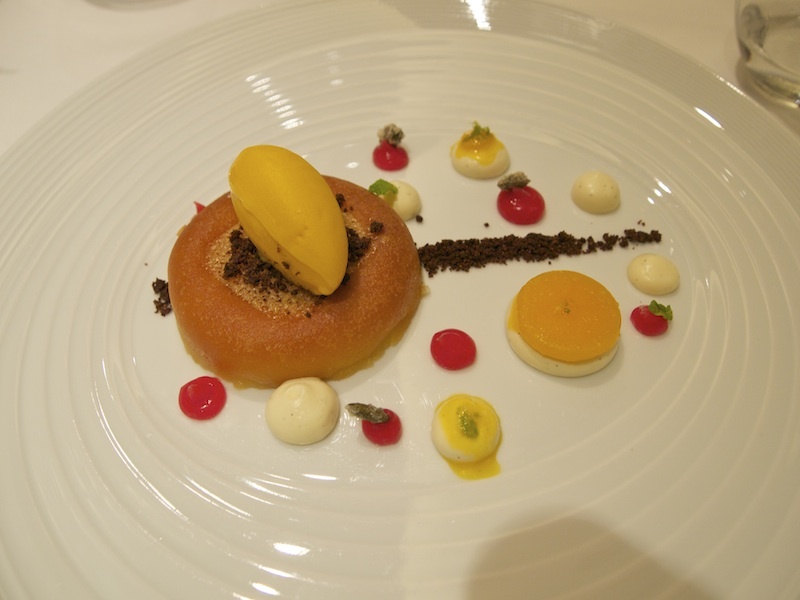 Fifth course, Passion fruit baba, mango sorbet and vanilla cream. A Cachaca soaked baba served with some fresh mango sorbet and dots of vanilla cream and pink grapefruit puree. The baba was moist but tasted simple and sweet and lacked a boozy kick. Rather disappointing, as obviously the booze is the point and the fun of a baba. Underneath the baba there was some buttery coffee and walnut crumble. 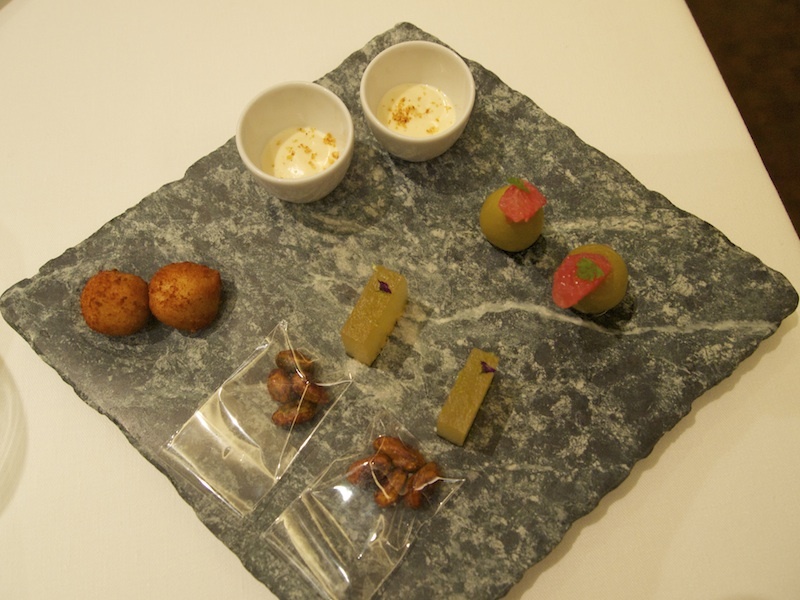 This tasting menu had some good, some not so good and some great dishes in it. The kitchen team at Lasarte is undoubtedly experienced and skilled. On the whole, Lasarte serves carefully prepared dishes, with excellent ingredients, that generally deliver on flavour and are attractively presented. Whereas some dishes were refined or even exquisite, others however lacked finesse and/or complexity. Unfortunately, there also were some errors that shouldn't really happen at this level. 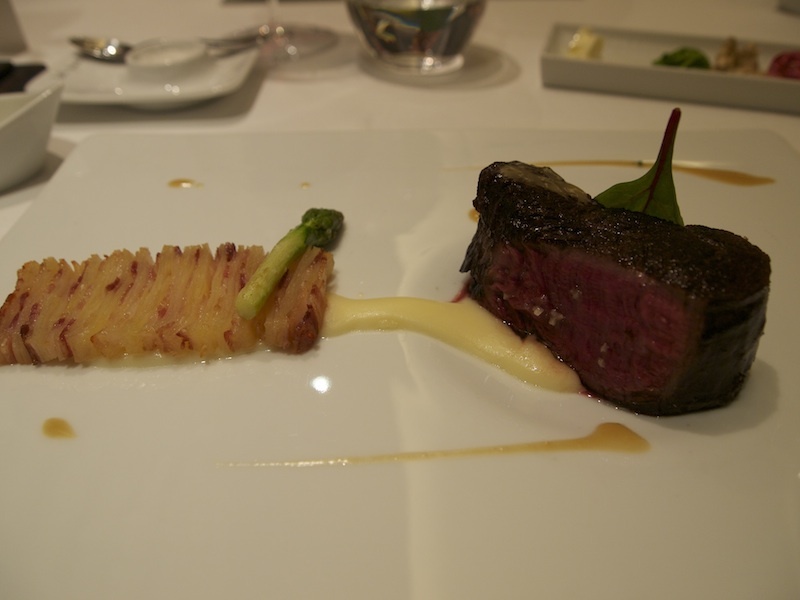 In the final analysis Lasarte is a beautiful restaurant and the service is excellent, but the dishes in the Lasarte menu were not very consistent and only partly lived up to their billing.